Sandali Punsarani is a Grade 5 student of the Veera Vijaya Vidyalaya in Inamaluwa. It is with a heart full of hopes and dreams that little Sandali left home early Sunday morning to sit for the Grade Five Scholarship Examination. But as fate would have it, the private bus that Sandali was travelling to school in, met with an accident when it collided with an army truck in the Inamaluwa area along the Dambulla – Habarana Road. “We were able to contact the Commissioner of Examinations. He made inquiries regarding whether she could be allowed to sit for the examination from hospital. The specialist doctor and the medical staff did the needful and the hospital coordinated the effort,” said Duminda Dias, the Medical Superintendent of the Dambulla Base Hospital. Thereafter, Commissioner General of Examinations, W.M.N.J. Pushpakumara took steps to ensure that the little girl who had been confined to the hospital bed, could still sit for the examination. An official carrying the examination question paper, under special police security, arrived at the hospital, and Sandali entered the record books as the first student to sit for the examination from hospital. The private bus that Sandali was trave;ling in, was plying from Sigiriya to Habarana when it collided with a Colombo bound army truck. Though Sandali was fortunate to survive the horrific accident, twenty-seven-year-old Sergeant Major Ranjith Kumara, who was travelling in the Army truck, was killed in the collision. 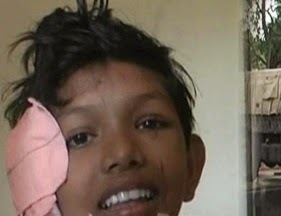 He was a resident of the Wewpitiya area in Monaragala.